All of our products have a 30-day money-back guarantee, (less shipping and handling). Money-back guarantees start at the date of delivery. 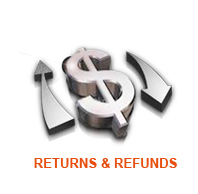 Returns must be postmarked within money back guarantee period. If you wish to make a return, you will need to obtain a Return Merchant Authorization (RMA) code from Get Moving Catalog. The RMA Code is included in the shipping confirmation email sent to you. I returned my order and I still don't see a credit on my credit card account. Can I return products for a refund after the money-back guarantee has expired? Do I need any paperwork to return my order? 1. The official RMA code must be written and clearly visible outside the package in order for us to accept your return. 2. Please remember to include ALL original packaging, ALL original contents, accessories and related documentation. If your returned products do not meet our requirements, we reserve the right to refuse your return. Please do not ship your return package COD because the package will not be accepted. 4. After your return package has been received and inspected, Get Moving Catalog will issue a refund amount equivalent to your initial order minus the cost of shipping and handling. A refund will be issued back to your credit card within 3 weeks from when your package arrived back to the warehouse. To expedite refunds, we request that returns be sent either via USPS, UPS or Federal Express. This will allow us to track any return packages shipped by you and ensure a quicker refund process. Please keep records of your return tracking number. We are NOT RESPONSIBLE for lost packages. Credit card refunds can take up to 10 additional days for your bank to complete, depending on their processing time. This can vary greatly between card issuers, and unfortunately we are unable to influence this process. Your funds are debited from our account immediately when the refund is issued, so contacting your credit card company directly to inquire may help. I returned my order and I still don't see a credit posted on my credit card account. When you send your package back, please make sure that you keep the tracking number of your return shipment. This way we will be able to know if your return has arrived to our warehouse. Once the package has arrived, please allow time for inspection of the product. Damaged products will not be refunded. A refund will be issued back to your credit card within a month from when your package arrived back to the warehouse. May take up to 10 additional business days for your bank to complete, depending on their processing time. These times can vary greatly between card issuers, and unfortunately we are unable to influence this. Your funds are debited from our account immediately when a refund is issued. Contacting your credit card company directly to inquire, may help. Order Get Moving Catalog Order Number : starting with the letters "TF"- (followed by 9 numerical digits), or your 7 digit order number on the Team Beachbody Packing Slip. Our order numbers are in this format ONLY. If your order number is not in this format, please cross check your records and contact the company where you made your purchase. Your return's shipping tracking number. Simply CLICK HERE and complete the FORM. One of our customer service representatives will look into your claim immediately. We may not be able to help you if any of the information listed above is missing. We cannot assist customers that have bought items from another website or company. Credits are issued back to the credit card used when the order was placed. Please allow a month from the time of our receipt of the return for your refund to post. Credit card refunds can take up to 10 additional business days for your bank to complete, depending on their processing time. This can vary greatly between card issuers, and unfortunately we are unable to influence this. When we process a refund, your return money is debited from our account immediately by YOUR bank or credit card issuer. Contacting your credit card company directly to inquire, may help expedite the posting of your funds into you account..
No. In order to receive a refund, you must return your product within the money back guarantee period. All Beachbody products come with at least a 30-day money back guarantee. We want to make sure that you have time to use the product and make sure that it is right for you. This guarantee period begins from the date that your order is delivered to you (not from the date that you placed your order). Yes, you should include your shipping packing slip with your return. If you no longer have your invoice/packing slip, write your full name, address, phone number and RMA number on a piece of paper and include it with the return. If you send your product back without any identification you will not be refunded. As much as we want to help you, will have no way to identify the return. So please, help us help you.